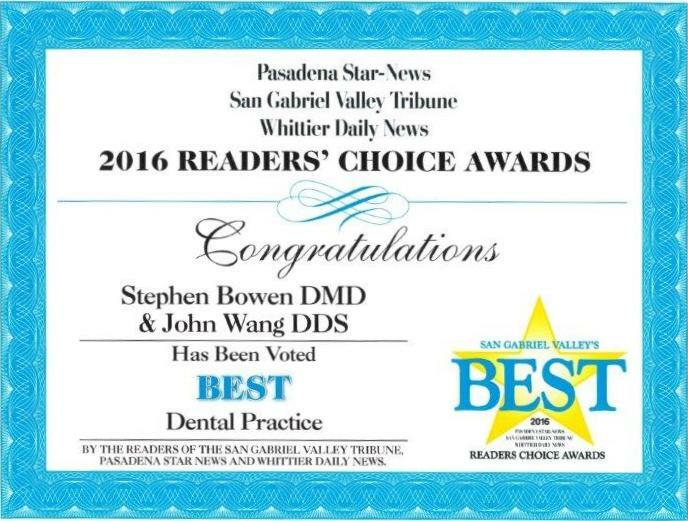 For over 35 years, Dr. Stephen W. Bowen has served as your Glendora dentist. As part of a family owned, legacy dental office, Dr. Stephen Bowen took over as primary owner after his father. The entire staff at our dental practice, including Dr. John T. Wang, treats patients like family. When you visit Drs. Bowen and Wang for your dental appointment, you’ll see some of the same friendly faces who have been helping patients at our office for years. Patients can depend on the quality of our work to meet their dental needs. We promote patient trust and comfort by providing dental treatment that lasts, cultivating a kind chair-side manner, and explaining all treatment beforehand. In their treatment approach, Drs. Bowen and Wang are conservative; they do not jump directly into treatment or over-treat by recommending procedures that address an immediate problem with your smile. In this way, patients come to trust our opinion as partners in their oral health and wellness. We welcome patients who are interested in creating the smiles they've always wanted, as well as those who are interested in second opinions on their current treatment plans. Our Glendora dentists understand that patients want to go to a professional where they know they will be comfortable and cared for. At every step, we provide the treatment you want and expect. Whether you haven’t been to a dentist in years or are looking for a new dental provider for dependable care, Dr. Stephen Bowen and Dr. John Wang are here to help. Our entire team prides ourselves on professional, friendly, and long-lasting dental care that helps you to feel as good as you look. Contact the office of Steven W. Bowen, DMD today for your next appointment! Drs. Bowen and Wang look forward to providing you with the best care possible. Call our office today for more information about our services or to schedule your next dental appointment. Our staff is proud to announce that we have received the Reader's Choice Award as the Best Dental Practice for a third year in a row!! Thanks to the readers of the San Gabriel Valley Tribune. Glendora, California Dentists, Dr. Stephen Bowen and Dr. John Wang are dedicated to cosmetic dentistry such as Exams, Teeth Whitening, Veneers and more.